Manhattan Just Decriminalized Public Drinking! Here's What It Means for You. 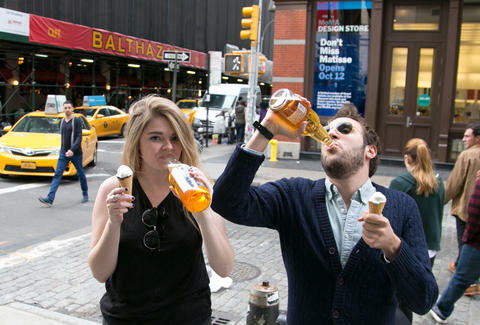 Realistically, a day doesn't pass in New York without seeing someone not-so-secretly drinking on the street or subway. Everybody loves drinking outside -- it's just prudent New Yorkers stick to patios and rooftops for fear of being arrested. But now, that policy's changing, and the city won't even arrest you just for cracking open a cold one in public. Really. City officials quietly announced Tuesday that starting March 7th, you won't be arrested for certain low-level offenses in Manhattan, such as public consumption of alcohol, public urination, and crappy subway behavior like riding between cars and taking up more than one seat, unless police deem it "necessary for public safety reasons." Additionally, the office of Manhattan District Attorney Cyrus Vance will no longer prosecute such low-level infractions, meaning getting caught sipping a beer on your walk home from a bodega, for example, will be a significantly less serious offense, according to a report by Gizmodo. To be clear, it's still against the law to drink in public under the new policy, but now, you might get slapped with a summons and fine instead of ending up in cuffs -- in Manhattan only. In other words, New York isn't about to transform into a boozy party full of go-cups and lax laws like New Orleans. Instead, city officials said the changes are designed to free up police and criminal justice resources used on low-level offenses so they can be allocated to focus more on violent crime. Somewhere, Rudy Giuliani is pouring one out for his broken windows policy. Under the current NYPD policy, cops can determine whether or not to arrest someone based on their existing background, or whether they have outstanding warrants, city officials explained in the announcement, which you can check out for additional details, if you're into reading police policies. Pretty weird hobby, that. The bottom line: if you want to enjoy a nice adult beverage in the giant outdoor bar that is Manhattan, you no longer have to sweat getting arrested for it. Tony Merevick is Cities News Editor at Thrillist and wouldn't mind walking around with a cocktail to-go on a nice day. Send news tips to news@thrillist.com and follow him on Twitter @tonymerevick.